Our names are Lyndsey and Abi and we are both about to start our final year of studying Speech Pathology and Therapy at Manchester Metropolitan University. 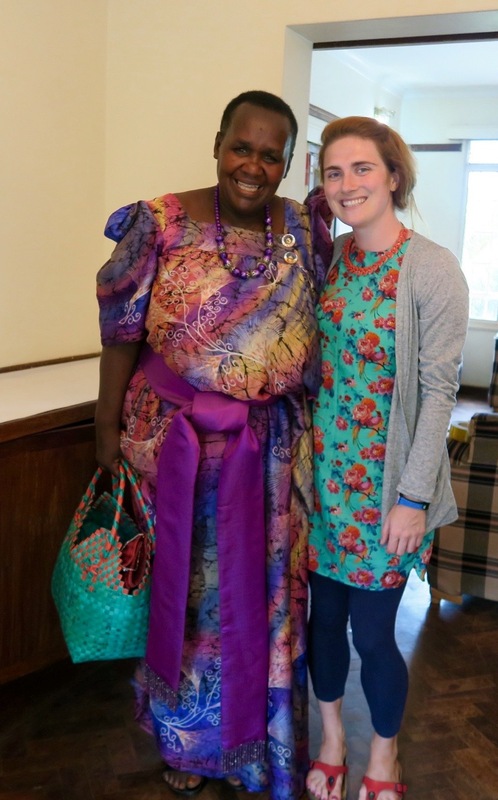 We have now been in Uganda volunteering with Lively Minds for two weeks and are just starting our third and final week – ‘a short but sweet stay’ in the words of Madam Sarah. The journey to Jinja from Manchester was very long but we were so overwhelmed by the lovely warm welcome we received on our arrival by some of the Lively Minds staff that the journey was soon forgotten! Unfortunately there was a football match on in Kampala the day we arrived so the journey back from the airport took longer than expected. As soon as we arrived we were greeted by a group of Lively Minds staff who showed us our rooms and took us to a local restaurant to buy some dinner. The house we’re staying in has a spacious dining/living room area where the Lively Minds staff eat lunch together during the weeks, and the office is in a building attached. We both thought volunteering with Lively Minds would be an excellent opportunity to see how child development and play is understood within a different culture. As Speech and Language Therapists, play and communication make up a large part of the work we’ll do and we were keen to share our knowledge with the Lively Minds team as well as learn new things ourselves! In the mornings, the Lively Minds staff complete administrative work in the office and this has given us the opportunity to deliver some training to further improve the team’s knowledge about the importance of play and communication within a child’s development. During our time here we have found out lots about Ugandan culture and the work that Lively Minds do within rural communities around Jinja. We have helped to give activity sessions on key topics that are vital for training mothers within these villages, as well as getting to see what happens within the play schemes that the mother run first hand. Session topics we have delivered include child sacrifice, communication, disability awareness and oral hygiene.We’ve also been able to visit play schemes to help monitor how they are getting on and if they need any further advice or training. On arrival at the villages in the afternoons we are usually greeted by lots of smiling children who are excited to see a muzungu (white person)! The women often greet us by shaking our hands and bowing, as this is their traditional welcome. They also give us praise and thanks in their traditional manner through clapping, as having a visitor is seen as a blessing in their culture. We were even given our own African names when visiting the village of Kanama; Sanyu (Lyndsey) meaning happiness and Birunji (Abi) meaning beautiful. We have tried to fit in with the locals by gaining our very own dresses which were handmade in Jinja. We’ve also attended a Ugandan wedding, which was a unique experience, as well as the cultural centre in Kampala, clubbing in Jinja and other activities around Jinja at the weekends. It’s been so great to see the difference the Lively Minds play schemes make to their lives of children and women in the villages. They are so grateful to receive activity sessions and always seem engaged and eager to learn. We’ve made lifelong friends with the Lively Minds team and want to thank the team for the memories that we’ll never forget. We made cake for the Lively Minds team! After the success of last year, we’re once again taking part in the Small Charity Week eBay auction. 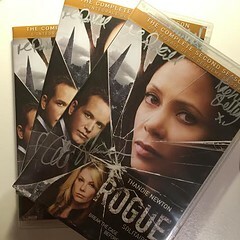 You’ll be able to bid on our eight exclusive items when the auction goes lives on eBay on 16 June. The auction is a fantastic way for small charities like ours to raise crucial funds. 100% of the winning bid from each item will support our projects in Ghana and Uganda! Last year our star listing of brunch with actress Rachel Shelley sold for an incredible £1400. As one of the top two highest selling items across the whole auction it also secured us an additional donation of £1000 from PayPal Giving Fund. Keep an eye on our Twitter and Facebook pages, as well as our website where we’ll be posting further details of the auction. Alternatively email us at laura@livelyminds.org and we can send you a reminder and details of the auction once it has gone live. Happy bidding! On 6 June, in exactly 2 weeks time we will be hosting our third Laugh Out Loud for Lively Minds comedy night, at the hugely popular The Comedy Store in London. The event will enable us to provide early childhood education for more children in rural Uganda. November’s event was a huge success with stand up from Katherine Ryan, Sara Pascoe, Shaun Keaveny and Tom Allen, and the event raised over £6,000. This allowed us to set up a new Play Scheme in Ghana where 160 children are now taught through play each week by 30 trained Volunteer Mothers. We hope that June’s comedy night will enable us to set up an entirely new educational Play Scheme, this time in Uganda. Tickets are £18 – that’s just £2.50 per comedian, and you’ll be helping to provide early childhood education for over 100 deprived children living in rural Uganda. We recently caught up with Mary who volunteered with us in Uganda along with her husband Charlie. 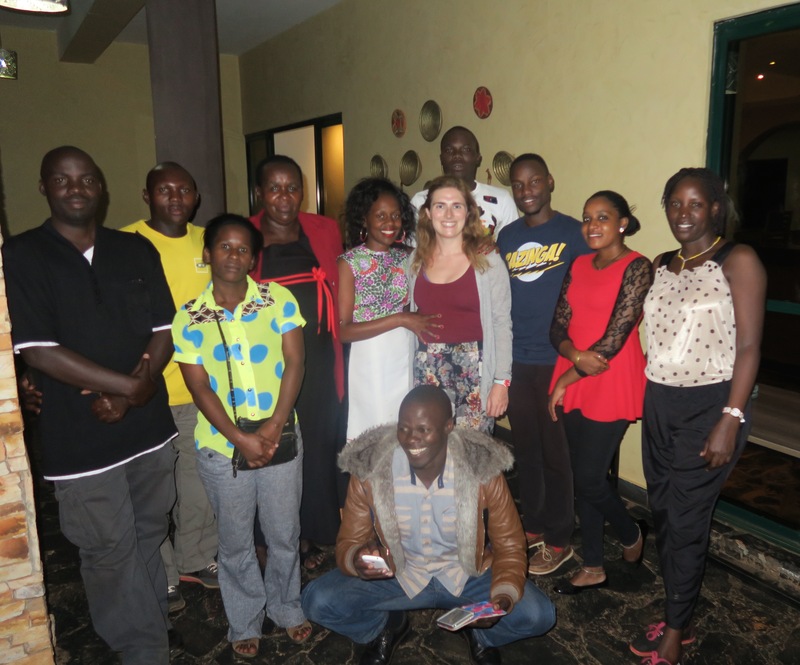 She shares their experience of seeing and supporting our projects first hand, as well as making the most of exploring all Uganda has to offer from our base in Jinja. How did you first hear about volunteering with Lively Minds? Charlie and I heard the Radio 4 Appeal about Lively Minds and later met up with Alison (CEO and Founder) who told us more about the charity. We felt that if we were going to support the charity to a serious degree then we should see the projects in action, and with the staff’s support made the plans to volunteer in Uganda. What are you career backgrounds, and how did you use your skills and experiences whilst in Uganda? Charlie’s background is in accountancy, and was Finance Director of a sizeable company for a number of years, so his expertise is in business. I was involved in Adult Education, although my subject was History rather than Early Childhood Education! Whilst out in Uganda, Charlie helped with setting up the financial model and giving advice about grant applications. What did you do whilst volunteering? While we were there we visited two Play Schemes, we watched the teaching sessions, taking photos and notes. We also took part in a discussion with the staff about children’s rights and parental responsibilities, which was to feed into one of the training workshops for the mothers’. What did you most enjoy about volunteering? To see the Play Schemes in action, and to see the difference they made to the lives of the villagers, young and old, has inspired us to remain involved, and to help in whatever way we can, now and in the future. We loved the warm welcome when we arrived in the villages, we loved the songs and smiles, and the obvious joy both mothers and children felt to be learning. Did you travel around Uganda much? We had travelled up to Murchison Falls before arriving in Jinja, and had had a few days fishing and on safari there. It was a great place to visit, and worked really well. We also had a half-day on Lake Victoria, fishing again, while we were in Jinja. Jinja was a good place to be based in – we stayed in a small hotel just down the road from the office. It felt very worthwhile to meet up with the staff team each day and to spend time with them. 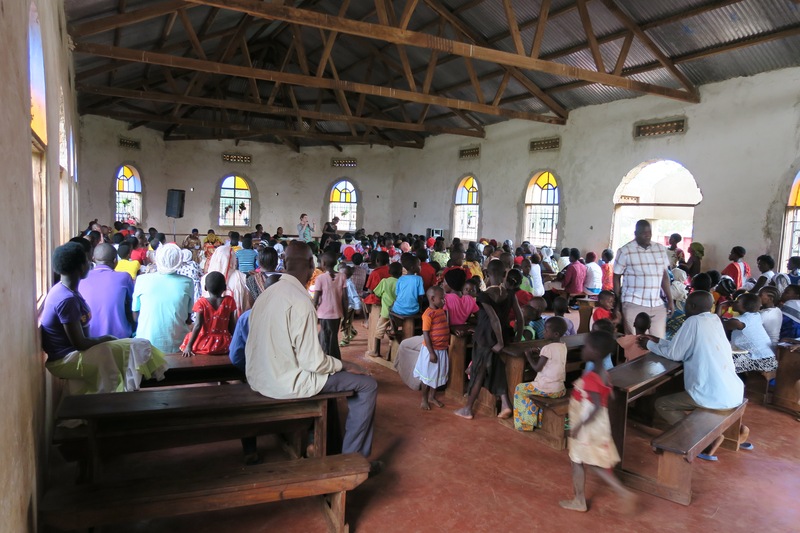 How have you stayed involved with Lively Minds on your return from Uganda? Our continued involvement is as donors, and Charlie is now a Trustee. He has helped with the accounts and financial advice, as well as other support. I have done some research into funding possibilities and help with Trustee meetings. We have also put friends and contacts in touch with Lively Minds, and we ‘spread the word’ whenever we can. 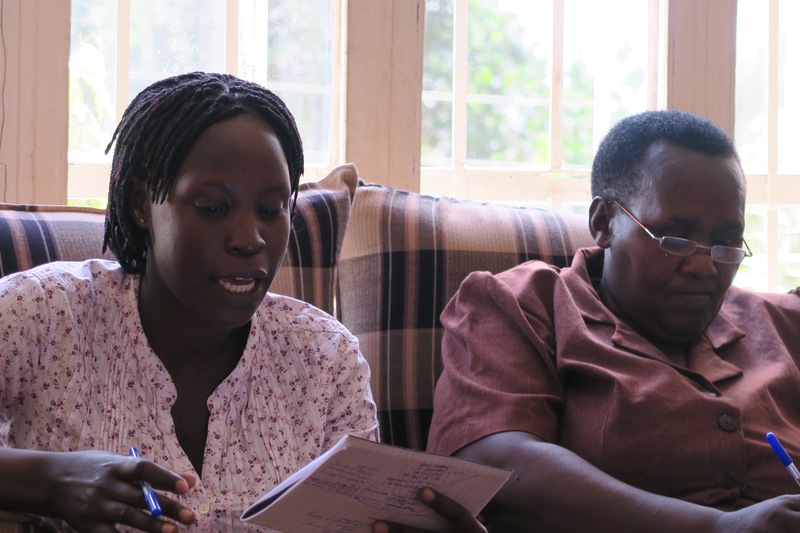 Lively Minds are looking for individuals who have a host of skills and experiences to support our projects in Uganda. Whether you’re a retired marketing executive, a semi-retired accountant or still at the peak of your teaching profession, we will tailor your volunteering & maximise your skills to make a lasting and sustainable difference to the communities we support. If you are interested in volunteering with us visit our website at www.livelyminds.org/skilled-volunteers to find out more or email laura@livelyminds.org. Happy International Women’s Day! Today we are celebrating the 3039 Volunteer Mothers who run our Play Schemes in Ghana and Uganda. Sahatu is one of our inspiring Volunteer Mothers at the Zangbalung Bihi Play Scheme in Northern Ghana. Sahatu Abukari is a 30 year old Mother of eight from Zangbalung Bihi village. Much of Sahatu’s adult life has largely consisted of farming to make ends meet, and cooking and cleaning for her family. Today Sahatu is one of 38 mothers at the Zangbalung Bihi Play Scheme. The Volunteer Mothers underwent six weeks of training where they were taught how to teach the children through play, and how to set up and run their own educational Play Scheme using the local materials around them. ‘I start at 9:00 and teach until 10:00. I teach the children many things including how to count, and how to recognise colours and objects… the children build their knowledge, and play. I think that it is helping the children to be more creative, and they are much better at maths now’. By becoming a Volunteer Mother, Sahatu is making a vital contribution to the development of her community. Sahatu enjoys meeting and working together as a team with the other mothers at the Play Scheme. She is a change-maker, not only for her own life and her children’s, but for the community as a whole. “I think the Play Scheme is good for the community and I would like it to continue”. Sahatu’s experience is similar to many of the Volunteer Mothers at our Play Schemes in rural deprived communities in Ghana and Uganda. Growing up in poverty, and lack of access to quality education, mean that many women in rural communities risk being marginalised. However, by training them as Volunteer Mothers, we empower women like Sahatu, and give them a voice and a standing in their community . In 2016 we aim to train over 1,400 Mothers in Ghana and Uganda to set up a further 38 Play Schemes. This will not only give quality early childhood education to over 4,500 children, but it will also give women like Sahatu the skills, vision and confidence to give their children a better start in life, and break the cycle of poverty. Support us this International Women’s Day, and become a change-maker for women like Sahatu. Donate here, or by texting WDAY16 £5 or £10 to 70070. When I arrived, one of the first things Sarah said was “your trip is too short”, and she was right! But quoting her concluding remarks “it was short but sweet”! And very sweet it was. My time with the Lively Minds crew in Uganda has come to an end and I leave feeling energised; glowing with fantastic memories and an abundance of new knowledge. When I initially approached Lively Minds to volunteer, Alison suggested that I facilitate training with the team. The opportunity to share some of knowledge that I’ve been fortunate to enjoy during my training as a clinical psychologist was one of the reasons I decided to visit Lively Minds Uganda. The only requirement was that the training should fit with Lively Minds aims and could be delivered by the team after I leave. I didn’t come to Uganda with a plan but after spending a few days with the team I started to build an appreciation for some of the difficulties that the people in the villages face, which in turn rise as obstacles to successfully implementing the play centre projects. And as we see across culture and context, one of most challenging problems we all face is our relationship with our self. 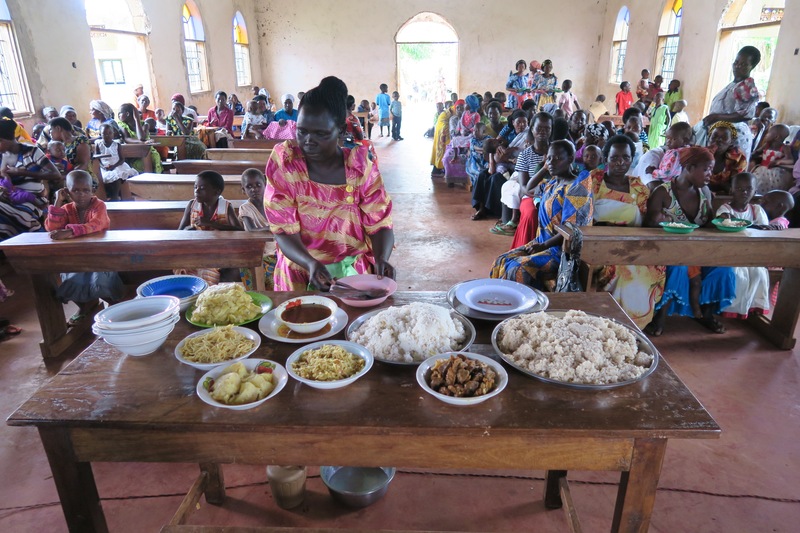 In the villages surrounding Jinja, many of the women have low self-esteem and low self worth as a result of chronic adversity including (but certainly not limited to) oppression, abuse, illiteracy, and poverty. As I mentioned in an earlier post, engagement with the play centres is having an immeasurable impact on these women’s self esteem and confidence. And of course it should, evidence from psychological research consistently highlights that engaging in meaningful activities that match with your values is very often powerful enough to combat low mood. Acknowledging that conversations and workshops on improving and maintaining good mental health are also important, Lively Minds runs Improving Your Self-Esteem and Maintaining Good Well Being programmes. I was delighted to see that these programmes draw on existing evidence by employing behavioural activation tools, cognitive change strategies and present moment practices. Anecdotally, the team say that these workshops are very powerful as they provide a safe space for these women to talk openly about their sense of self, which for many is an entirely new experience. Given their power, we become blinded by our cannots and failures; our successes and strengths are discounted, immediately erased. And through no fault of our own, our stories about ourselves become problem saturated; leaving us stuck, feeling and being helpless and disempowered. I wondered if this was true for the women that Lively Minds work with. As naive observer I saw skilful, strong, resilient women working as best they could to care for their children, provide for the families and offer more to their community by running the play centres. Yet, the stories that were told were loaded with themes of hopelessness and sadness. In light of this (and sticking to what I know) I offered the Lively Minds team training in a resilience-focused intervention called the Tree of Life. 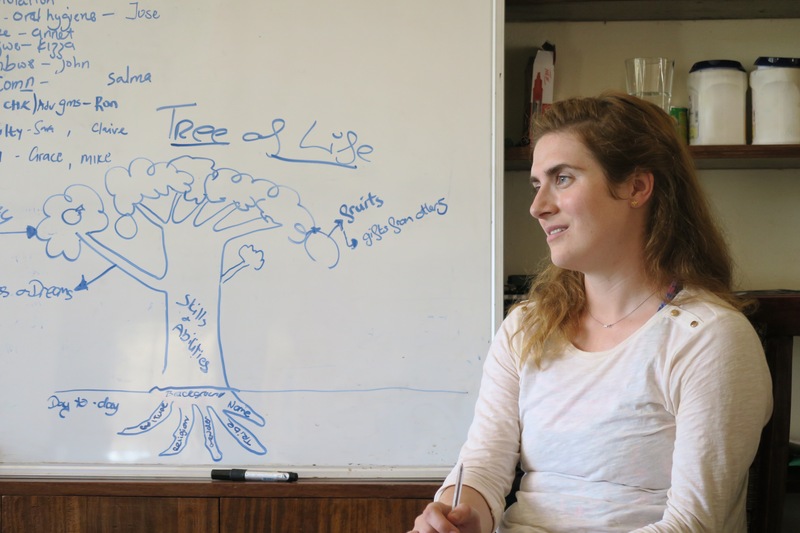 The Tree of Life is a psychosocial support tool that originated in South Africa which uses different parts of the tree as metaphors to represent aspects of our lives. For example, the roots are your background, where you have come from. The trunk are your strengths and abilities and the branches are you hopes, dreams and wishes. Through these metaphors we are allowed to construct and tell true stories about our life that focus on our skills, abilities, hopes and dreams. Together we hoped that the Tree of Life would be an effective addition to Lively Minds self-esteem and well-being programmes. 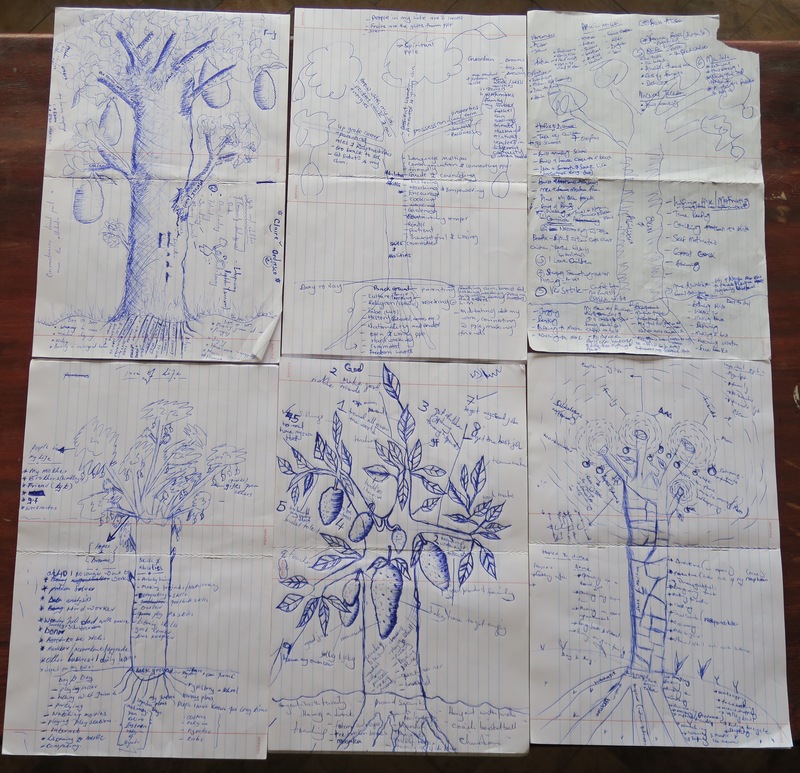 So over six days the team and I engaged in intensive Tree of Life training. 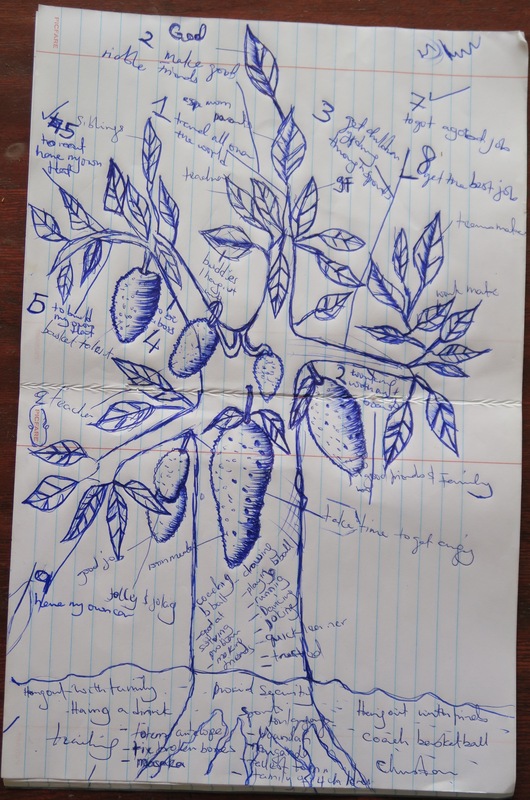 We started by completing the exercise ourselves, drawing out our trees, telling our skills an abilities focused-stories, sharing how we’ve over come adversity. Having been active participants, we then practiced modifying the intervention to fit the needs of the women in the villages. We had the fortune of pens and paper to draw our trees, literacy to write words to describe the parts of our tree and the luxury of time to elaborate on our trees. None of these are readily available in the villages. However,with the invaluable input from the Lively Minds team we put together a programme that is ready to be taken to the field. 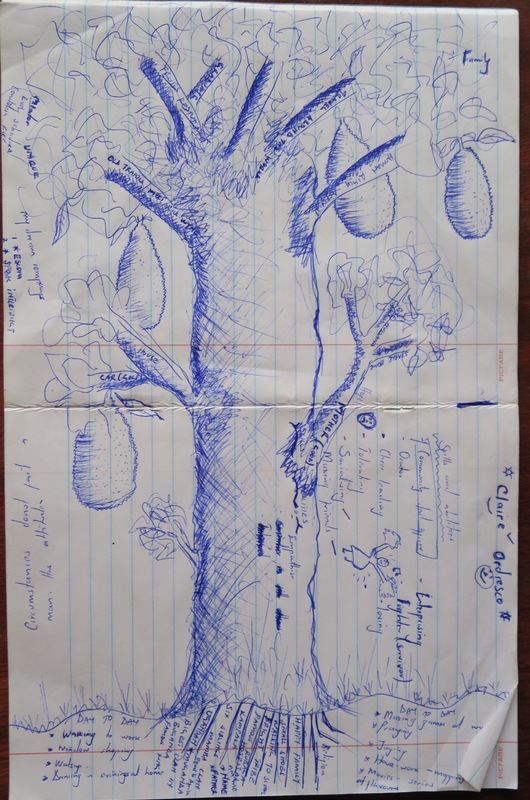 Although we didn’t have time to trial the Tree of Life in the villages, I am leaving its implementation in the competent hands of the wonderful Joshua, Sarah, Grace, Ronald, Cliff, Salma & Josephine. Lively Minds celebrated a graduation in the village of Kazosi. Thirty women successfully finished the Education Through Play training and are now fully fledged to begin successfully running the play centres. The team correctly anticipated a big celebration. When we arrived at the building where the graduation & play centres were to take place, we were greeted by the women who chanted, sung and danced to mark our arrival. Sarah, Salma & Grace enthusiastically joined in with the dancing and I sheepishly tried to move my rigid body! My attempted dance moves were met with some giggles.! The women had invited all their friends, their husbands, the pastor and local political & community leaders to the celebration. Before the ceremony commenced, we were presented with an overwhelming spread of pusho, martoke, rice, spaghetti, meat & greens. The men, who sat at the front, segregated from the women, were served first, then the Lively Minds team and the rest of the well-wishers. Grace enthusiastically opened the ceremony with introductions and explained the purpose of Lively Minds to the wider community members. She explained Lively Minds ethos of providing a sustainable free service. She also explained that the women running the play centres are volunteers, and so offering their community an invaluable gift. Salma and I told a story comparing two mothers, one who educated her son through play and the other who did not provide her son which such opportunities. The story was interactive and community members were encouraged to predict what happened to the two sons and explain why. 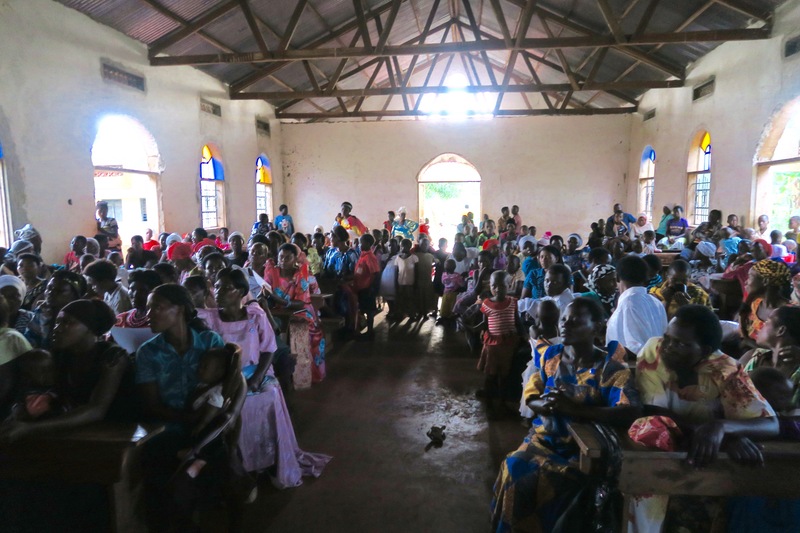 Before certificates were distributed we heard testimonies from two of the women. They described self-pride and achievement in completing the training and excitement about providing such a valuable service to their community. The ceremony also provided a space for the community to ask questions about Lively Minds. Most offered comments of gratitude, however a number of men and women alike asked what Lively Minds is going to provide for their older children? They wanted to know how Lively Minds, or what NGO, will ensure that their children access and remain engaged in primary school education? Grace sensitively answered by encouraging community members to take responsibility for their children’s further education, to put pressure on their recently elected local representatives to provide families with support so that their children do not have to work in the sugar-cane plantations and instead can remain in education. What was clear from their comments was that this community need and want more. Small NGOs like Lively Minds can’t help these communities overcome all of the challenges they face in accessing education for their young ones, nor should they. Instead, the services Lively Minds creates an opportunity for local people to learn more about the importance of education. Knowledge is Power. And with this knowledge these communities are empowered to begin to more actively demand more from those who run their country.